NELSON J. HOWARD, M.D. ; C. R. JACKSON, A.B. ; EDMUND J. MAHON, M.D. A study of the end-results of our treatment of varicose veins by the injection method during the past three years has revealed a startling percentage of recurrences. In a small series of sixty-six cases, recurrence has been observed a year or more after thrombosis in fifty-two patients. These results are in such contrast to the enthusiastic reports of the treatment of varicose veins by injection that a critical review of the therapeutic thrombosis of varicose veins seems justified. 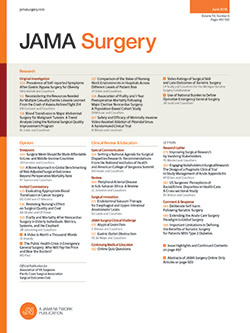 The wave of enthusiasm that several years ago greeted the treatment of varicose veins by the injection of sclerosing agents gave the method an impetus that has not been justified by the ultimate results, and it is becoming increasingly evident that a more careful elimination of unsuitable cases and a return to surgical procedures combined with injection of sclerosing agents is necessary to obtain satisfactory and more permanent results.